RICHMOND, VA - The Richmond Flying Squirrels will partner with Hops for Heroes to serve Homefront IPA at The Diamond during their game against the Trenton Thunder on Thursday, May 23rd. Homefront IPA will be available at the Squirrels' Virginia Beer Taste the Local stand with all proceeds benefitting Operation Homefront. Operation Homefront is a non-profit organization that assists the families of military personnel when they fall on hard times. "We are thrilled to be partnering with Hops for Heroes to aid Operation Homefront," said Flying Squirrels Vice President & COO Todd "Parney" Parnell. "We are constantly striving to honor and assist our military personnel, and to be able to do in such a creative and baseball-oriented way is extremely exciting for us." 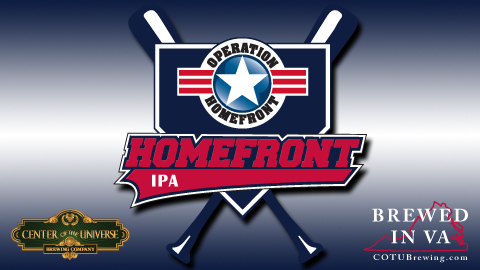 "From its beginning in 2011, Homefront IPA has been all about beer, baseball, and most importantly, America's Troops," said Chris Ray of Center of the Universe Brewery Company. " It debuted at Safeco Field in 2011, so it was only appropriate to continue that tradition with the Flying Squirrels in 2013. We believe the Flying Squirrels share the same belief in charity and community as we do, making it a perfect partnership." The media tasting on the 22nd will also include media availability from Flying Squirrels' personnel, Chris Ray and members of the United States Military based at Fort Lee, located in Petersburg, VA.